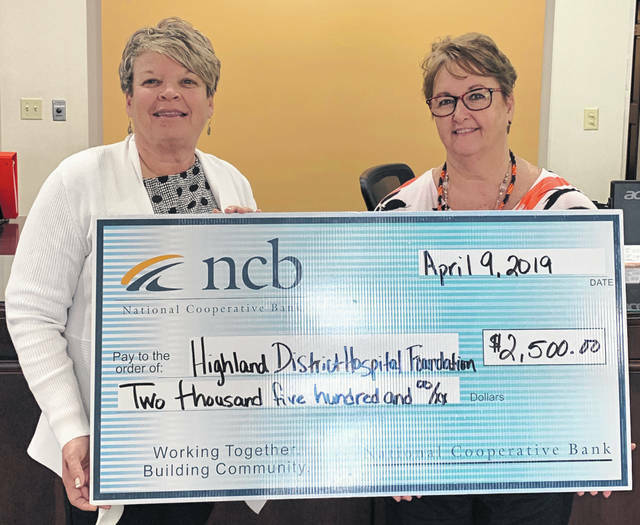 NCB donated $2,500 to the Highland District Hospital Foundation recently for its annual health fair. The annual health fair is scheduled for Saturday, April 13, and offers participants a comprehensive lab panel for a nominal fee. Pictured are Cathy Jones, left, HDH Foundation director, and Tammy Irvin, NCB branch manager. https://www.timesgazette.com/wp-content/uploads/sites/33/2019/04/web1_HDH.jpgNCB donated $2,500 to the Highland District Hospital Foundation recently for its annual health fair. The annual health fair is scheduled for Saturday, April 13, and offers participants a comprehensive lab panel for a nominal fee. Pictured are Cathy Jones, left, HDH Foundation director, and Tammy Irvin, NCB branch manager.